giowck Hey yahiatnt, Last days my average has begun to drop dramatically, then I started to work on my recycle strategy and with the help of your software I spotted a lot of unprofitable RRs that had a high average but with a bad profit for the last 7-15 days (minus profit). Now my average is profitable again. Thank you so much! I'm not the excel guy, hate to do a lot of work to import every day the RR list. So without your software I would have given up a long time ago. nca89 Hi! I love your software very much. I used to spend a lot of time everyday copying my rented referrals on a spreadsheet in Excel, but now using this software it only takes me some seconds. 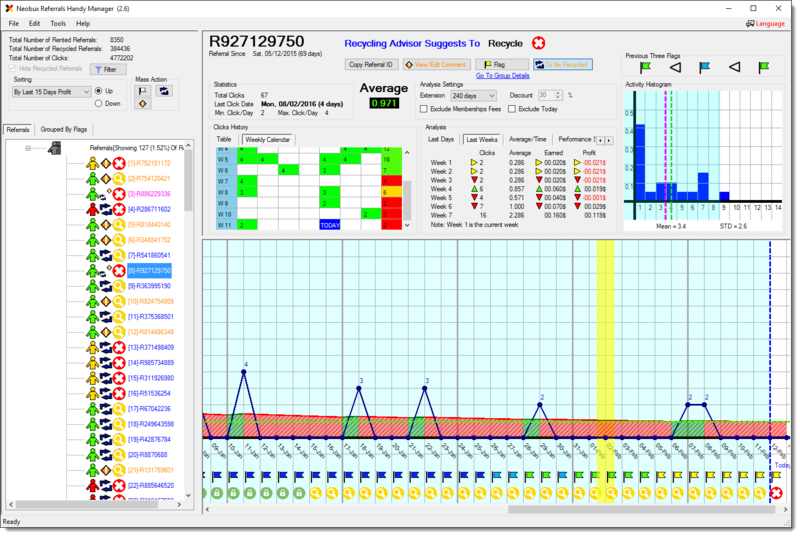 I also save a lot of time when it comes to recycling referrals thanks to the many filters your software provides. Because of all that I am so happy! 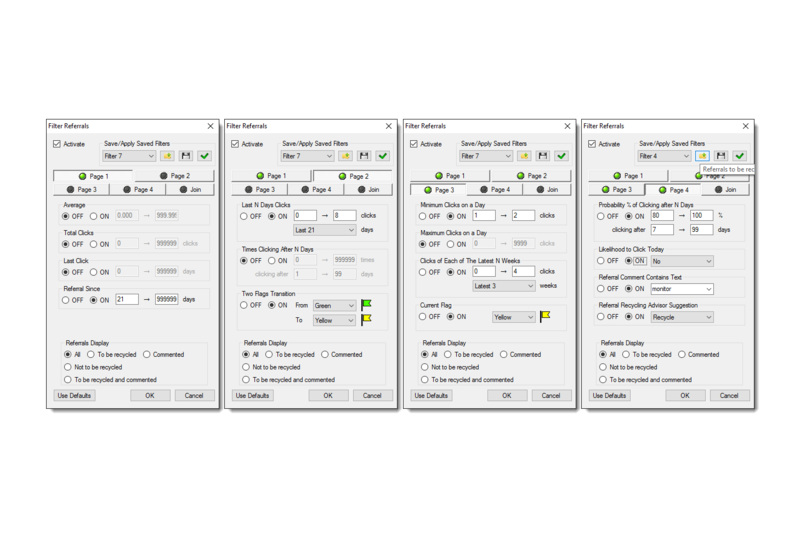 This software does what it has to do: helping you to save your own time, automating many tasks and making it so easy. eraser2011 The full version of the Neobux Referrals Handy Manager changed the way how I use Neobux. I don't need any Excel spreadsheets, scripts or something like that anymore to keep track of my referrals! It is now a lot easier for me to analyse them and to make decisions based on the handy graphs in this software. It is also much quicker to recycle your Reffs, just set the filter how you like it, sort and mark them and use the Referrals Recycling Assistance Wizard. This software is worth every penny and I don't regret that I bought it! pythagoras345 I just love your tool. Use it daily from day one and it has thought me a great deal in a very short time as a newbie. It is also a time saver. And above all, I couldn't make such a tool. Actually one can see the effect of recycling in the Handy RR Manager in the average of the whole team. It raises if one does, it sinks if one doesn't or does less. And pretty fast. nateandcourt I have been using the free version of your software for a month now and I love it. Just completed an order for the full version a min or two ago. Can't wait to use it. danjef Credit to yahiatnt for such a great tool, prob wouldn't even use neobux if it wasn't for this tool. So, you have started to RENT some REFERRALS on NEOBUX and not sure what should you do afterwards when their AVERAGE is TOO LOW or you aim for HIGHER AVERAGES from them? The idea is that you have to use the right tool to ENSURE RECYCLING ONLY THE TRULY BAD REFERRALS in order to MAXIMIZE your EARNINGS. Continue reading and SEE FOR YOURSELF how you can SAVE TIME, EFFORT and MONEY right from this moment! It's SIMPLE, with the help of many experienced users' ideas and suggestions during the past SEVEN YEARS, I have developed this evolving desktop SOFTWARE for helping me and you of course, on MONITORING the RENTED REFERRALS EASILY, QUICKLY and EFFECTIVELY without any troublesome Excel sheets or pen and paper ways trying to understand what you have rented! 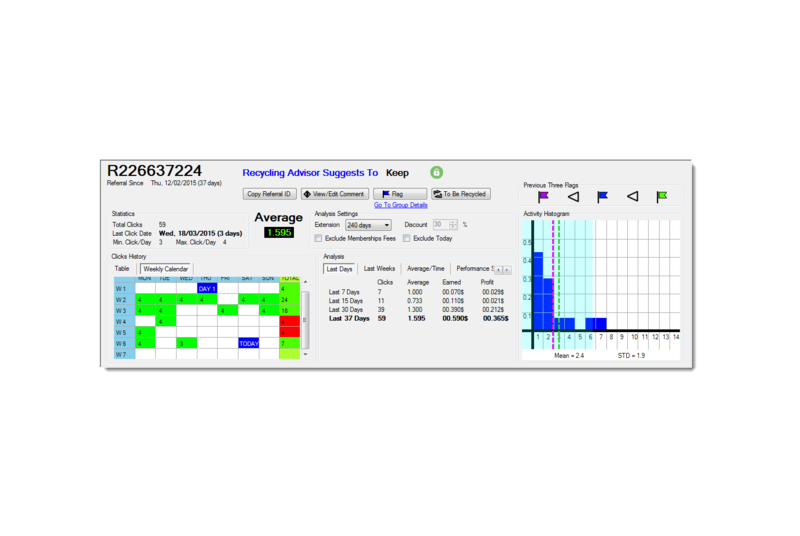 All you have to do is to import the exported rented referrals data daily from NEOBUX, apply filters, analyze graphs and profit , mark which referrals to be recycled, then perform the recycling! Why this software is the ultimate solution for managing Neobux rented referrals? You can quickly see previous clicks history of each referral up to 240 days long. Also, this graph shows the history of flags and recycling advisor suggestions. See the average, minimum/maximum clicks per day, the calculated average, earnings and profit on different durations for each referral to identify whether he is making you gain or lose. To focus on specific referrals based on certain criteria. 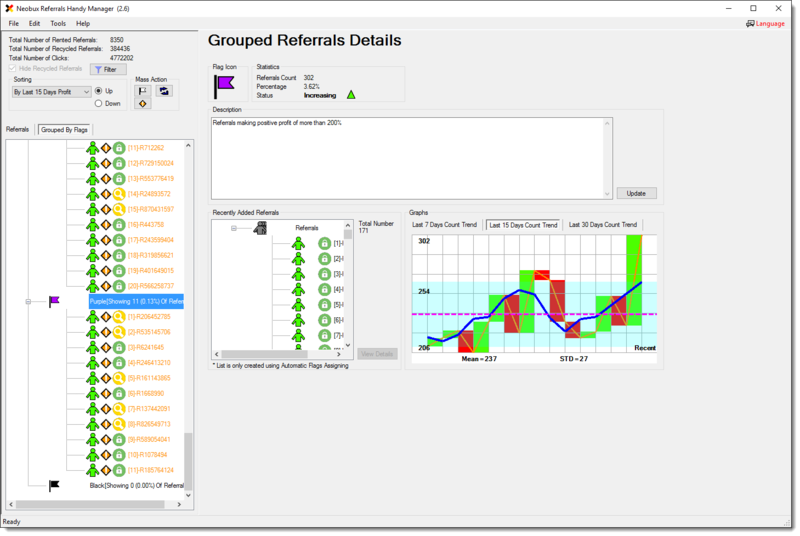 The software has the referrals filtering feature which helps on changing the currently displayed referrals so that it becomes easier for you to focus on particular group to analyze. Sort your referrals ascending/descending based on their average, last 15 days clicks, last 30 days profit, and more! Thus, you can quickly identify which are the best referrals and which are the worst. Fast and easy to start utilizing it as your method of managing your referrals, even if you have months of old exported referrals data text files. Just import them as one or few batch(es) and you are ready to go. 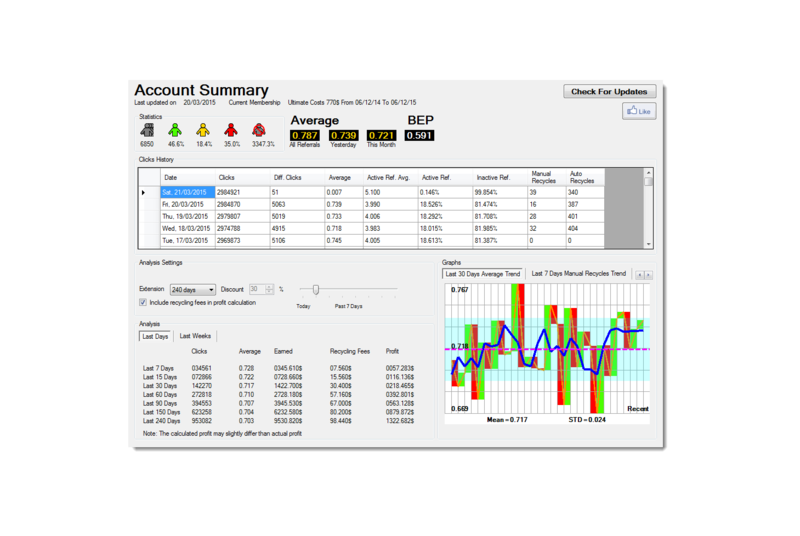 Then easily update your referrals data by just pasting the copied exported referrals data from Neobux directly to this software everyday. Check out the amazing new features added to Neobux Referrals Handy Manager. What's new in version 2.7? Kindly, reach us on any of the following channels.